As we all know, the inability of Congress to act decisively and with consensus about much of anything–if the Democrats issued a statement noting that the sun rises in the east there would be an instant outraged Republican rebuttal blaming Obama and explaining the Republicans’ refusal to acknowledge the power of the sun, since that is an attack on JC (Job Creators, and probably the other JC too)–that inability has now been harnessed to the other inability–to cut a nickel from the war profiteers who have hijacked our national economy and consciousness. The Republicans and many Democrats have two shibboleths they work to death. One, here comes terrorism. Devote half our discretionary budget to building and deploying nuclear submarines, giant Stealth bombers, aircraft carriers and their battle groups, ground-launched intercontinental ballistic missiles based in Colorado, the Dakotas and across the western US–whoops, don’t mention that none of these is of any use against terrorists. But they are all so profitable for BAE Systems, Saab, Simplex Grinnell, Fabrique Nationale de Herstal, Mitsubishi, and other of the red-blooded patriotic US ‘top’ 100 Pentagon contracting corporations–oh, that’s right, none of these are US corporations, nor are many others in that elite list. Jobs for Brits! Jobs for Japanese! US tax dollars to create military jobs in Belgium! Two, cutting the US military budget is cutting jobs. Wrong, wrong, and wrong. Invest in anything else (with the exception of building colonies on Mars) and we will be creating more jobs by spending your tax dollars on that sector. Cut a $B from education and lose more than 25,000 jobs. 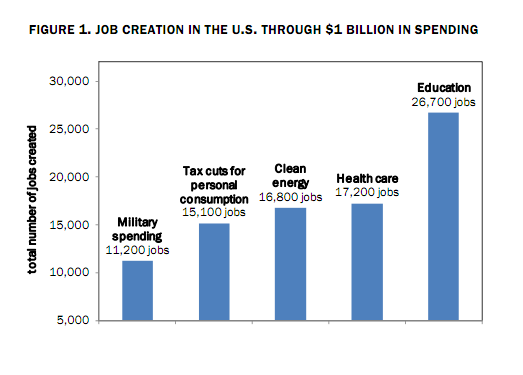 Cut a $B from the Pentagon and lose 11,000 jobs……duh, choose wisely, Congress. As we cruise along toward the ‘fiscal cliff’ when Congress is forcing itself to choose where to cut, we will pay attention and we will apply pressure or we will watch Raytheon and General Dynamics and Lockheed Martin back up to the Pentagon in fleets of armored vehicles to haul away convoys of cash that you worked for. They will preserve a war system that is corrupting and breaking us, or, if we do get involved in enough numbers, we will shift it all toward a peace budget that will radically shorten the height of the fiscal cliff while strapping a peace parachute on working Americans and those in greatest need, our children, who deserve a softer landing. Seems like an easy choice. Help your Congress reps make it. Tom H. Hastings (pcwtom@gmail.com), Portland, OR, directs PeaceVoice.